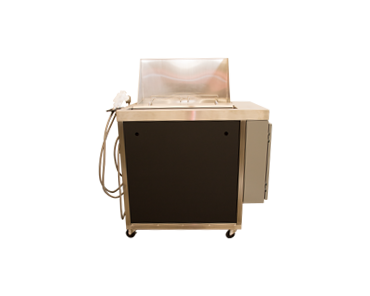 The AKS Stencil Cleaner is a world-class ultrasonic stencil cleaning system. It provides manufacturers with excellent cleaning performance while meeting budget and floor space requirements. Ideal size for multi-workstation set-up, the AKS Stencil Cleaner requires minimal space while delivering uncompromising cleaning results. If budget, floorspace, or multiple workstations are required, look no further than Aqua Klean’s ultrasonic stencil cleaning system. Easy to program and operate, simply place your stencil in the rack and press the start button. The stencil cleaner will lower your stencil into the wash tank, which is filled with high quality detergent, and is ultrasonically cleaned by high-speed microscopic bubble implosions. After only a few minutes, it then lifts your cleaned stencil from the wash, and you spray-clean by hand to remove the loosened solder paste and other contaminants. Last, you use a low-pressure dry air gun removes the remnant rinse moisture and your stencil is ready to be used again all in only a few minutes time!